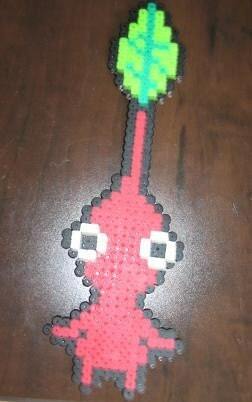 Here's a Red Pikmin I just made this afternoon. Love the way it came out, and can't wait to make more (i.e., if you'd like one that isn't red, or leafy, request one at [email protected]). This guy (and the next one) was made on a lazy Sunday afternoon, but I love the way it came out. Plus, the jumping motion is a lot better looking than just the static, driving Excitebiker. ...man, I just realized that all of these pictures are pretty bad. Ah well, screw it. 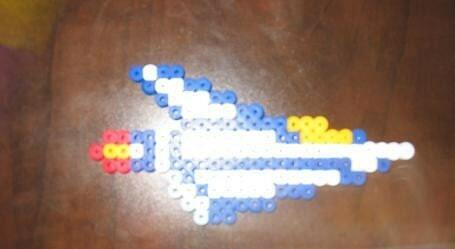 I LOOOOOOOOVE me some Gradius, so it only makes sense that I bust out a Vic Viper sprite. Yeah. So you know the deal. 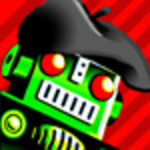 Check out the store or hit me up e-mail way if you like what you see. 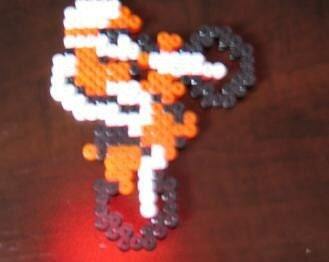 Also, like the great Faith before me, I'm kinda at a loss as to what I should make next. Anyone got any ideas for unusual sprites/characters from ANY GAME/MOVIE/TV SHOW you'd like to see? Then let me know in the comments, and I might just make your request next!